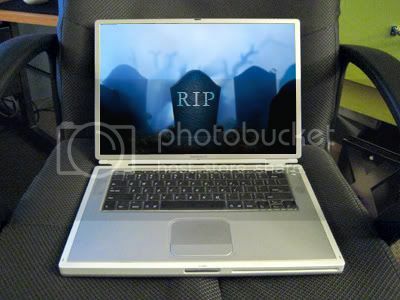 IAN SHEH | BLOG » Blog Archive » it finally died! after five and a half years of virtual torture, my Apple PowerBook G4 800Mhz finally gave out on me. i would have hoped that it would have gone out in some glory but i was saving a tiny php page, and that seemed to be enough to fry the motherboard. to be honest, it doesn’t owe me anything. i’m actually quite amazed that it didn’t catch on fire or completely melt. i remember running OS 9 on it!!! and up until 3 weeks ago i’ve been doing all of my photography, design and video editing on it. i have a shiny new Mac Pro that is faster than i can even think. so i don’t think i’ll be buying another laptop until i really need one for an assignment. rest in peace laptop, you’ve served me well.